Breathtaking! That's the view of the white sandy beaches and the turquoise Mediterranean from this small, modern complex (7 apartments). 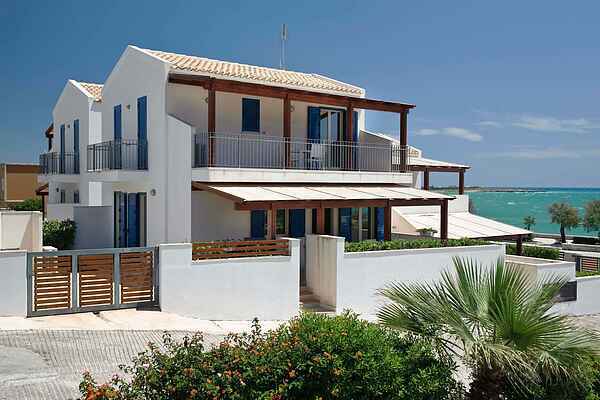 Hence the name: Casa Azzurra (the blue house)! From your apartment you can walk straight onto the promenade to the beach. Casa Azzurra is located in a quiet neighborhood of Marina di Modica. It has recently been renovated and all apartments have a sea view. The apartments are bright, modern and tastefully furnished in Mediterranean style and have air conditioning. All apartments have a private entrance and a low outdoor shower to rinse your feet after a day at the beach. You have access to your own parking space in the garage. Marina di Modica. The coast at Marina di Modica is considered to be one of the most beautiful parts of Sicily. The sandy beaches are flanked by dunes and the sea is popular with surfers, with or without a sail. But even for those less inclined towards sport, the coast here is a true paradise. During the day you can enjoy the sea and relax on the beach. In the evenings there is fun to be had the bars and restaurants by the beach. The old town of Modica (21 km) lies further inland and consists of two parts: Modica Alta (the upper city) and Modica Bassa (the lower city) that are interconnected by picturesque stairways. The cathedral of San Giorgio with its ornate facade is the most important building; its tower has 160 steps. Modica is recommended for sweet tooths. That is because the city is known for its chocolate. Since the 18th century, this delicacy has been prepared manually and in the traditional way. Combined with vanilla, cinnamon or red pepper it's a treat for the taste-buds! A little further east lies Noto (30 km), one of the most beautiful Baroque cities of Sicily. After the earthquake in 1693 the city was rebuilt with tuffstone, which gives a warm, yellow glow to the buildings. Just like Modica, the city is a UNESCO World Heritage Site. Syracuse (70 km) is also within reach for a day of culture. Here you can admire the ancient Greek theater and the catacombs of San Giovanni. On Ortigia, Syracuse's peninsula, there are plenty of lovely shops for an afternoon of shopping, as well as cafes and restaurants for enjoying some wine and fresh, fried fish. The Vendicari (30 km) nature reserve is also very popular. Here you can enjoy the tranquility of nature and enjoy the scent of thyme and rosemary, herbs that grow in abundance here. A haven for birdwatchers, where egrets, storks and flamingos gather frequently in the autumn. Grocery shopping and restaurants are just 150 m away. Bank, post office and more restaurants in Pozzallo (5 km).